Play is a free, explorative and iterative process to discover new meaning and is an important element for innovation. For children, it is unstructured, free and open-ended play through which they can develop their own creativity and interests. However, parents are increasingly underestimating the value of play while prioritising more structured activities and academic performance, a trend which is causing an increase in mental health issues in today’s youth. Thus we created Knotty as a new way for children to engage with technology that stimulates and leverages their creativity and curiosity rather than simply providing passive stimulation by applying craft-like elements. Through use of a simple and intuitive knot-tying interaction to connect inputs and outputs, Knotty acts as a tool for children to explore and apply technology in a way that enhances their open-ended play and leverages their creativity. Knotty consists of six input and output blocks, which when joined together creates an array of amusing functions. The uniqueness of Knotty lies at its core interaction; to connect the inputs and outputs together children simply need to tie a knot from one block to the other using Knotty’s magic rope and then they’re ready to play! 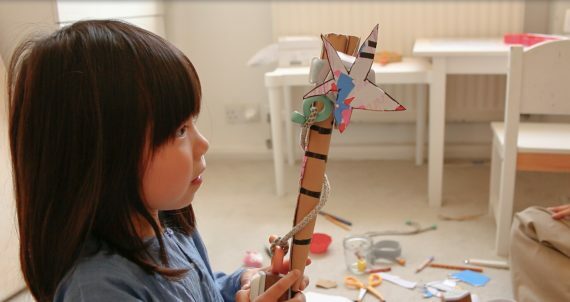 Make a magic wand from a shake-sensor block and a motor block, or connect a microphone block and an LED block to create a sound-triggered blaster gun! In addition, Knotty is designed to combine with and adapt to other materials. Stick it onto card, use the strap accessories to join it to bottles or attach it to your wrist and make a wearable! With Knotty, kids can experience an entirely physical form of coding, and with its intuitive and craft-like interactions, Knotty makes creating, iterating and playing with technology effortless and instinctive. While Knotty’s structure teaches children the fundamentals of coding, the core appeal of Knotty puts leveraging children’s creativity first, rather than the play simply being a by-product of the learning.